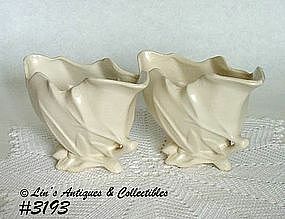 Beautiful and difficult to find McCoy planters from the Lily Bud line of 1941! There is a pair in this listing – one planter is absolutely perfect and one has a production flaw causing a super tight (like a pencil mark) hairline. The flaw: a small piece of pottery at rim edge came loose when removed from the mold and was smoothed back on prior to firing. During the firing process, a stress developed at one end of the flake and it also separated ever so slightly where the flake was smoothed on the rim. Do not be deterred by my description – what I have described is production because it has color and glaze. The only possible “use” evidence is the super tight hairline I described earlier – it is on the outside and originates at the smoothed over flake – I’m undecided if it’s “use” or if it occurred during the firing/cooling process. Whatever the cause, these are beautiful items and an excellent addition to any McCoy collection!